I mentioned a few weeks ago on twitter (come say Hi!) that James's Grandma bought me a makeup bag for Christmas. I think she may have unintentionally bought me the best present ever! Now I think this may need a little explanation, because I am sure you are thinking "Surely you already have makeup bags, you had a beauty blog!" and yes I do, but I have always struggled with them. 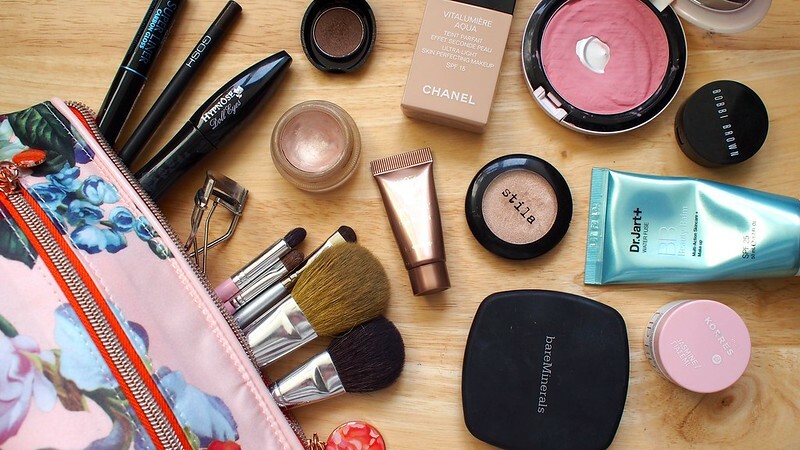 I previously kept all my makeup in my desk drawer neatly organised by type mainly because I have never found a makeup bag that I was happy with. They were always either too big, too small, or a nearly unusable shape, and my main issue when I am getting ready in the morning is time. I need to get my face on as quickly as possible so that I can get out the door. I have been feeling a little self conscious of having all that makeup on display though lately and wishing I had less of it. I am rubbish at using things up though unless they are the only products at my disposal so a makeup bag was the solution I have been craving. I had been planning to pick out a selection of products and just use those for a while so when I unwrapped the Ted Baker beauty that Grandma had kindly given me I did a little skip of joy. The size of this bag is absolutely perfect. I can fit in all my every day face stuff and some extras for if I want a couple of options (mainly for sudden social occasions). The shape is big enough that I can squeeze in the Naked palette if need be, but if not there is plenty of space to rummage through what is in there without taking it all out. In fact, confession time, there were a couple of extra items that I couldn't happily fit into the photo (they skewed the composition, 'scuse my nerdiness) but which happily fit into the bag, I will mention them below anyway. First up, face products. Chanel Vitalumiere Aqua in 20 Beige has been my favourite foundation for times when a BB cream isn't quite polished enough. It smooths over my imperfections and looks like skin without being too heavy. For every day though I grab the Dr Jart+ Water Fuse BB Cream. I have been using this for a while now and this is my second tube, I think it is wonderful for providing a bit of extra hydration throughout the day but I have to admit I might give one of the other formulations a go next time as I have found this is making my forehead shinier than I like. Generally I don't bother with concealer, I find it a faff to apply to blemishes so I only really use it on the under eyes. My product of choice currently is Bobbi Brown's Corrector in Light to Medium Bisque which I am actually trying to use up because I find the formula a little too creamy, but I do like the colour as it is perfect for correcting the blue of my dark circles. The blush pictured here is one I have been trying to finish for the longest time, it was my first ever MAC purchase, and it is actually a limited edition Beauty Powder called Blush of Youth similar to Well Dressed. It is a gorgeous pale pink which makes me look fresh and awake without being too bright, but it takes a hell of a lot of building up because it is so pale. To pack a bit more of a punch I pair this with the MAC cream blush in Ladyblush which wouldn't fit in the picture. I never use this without a powder on top because it is so creamy it slides off my face, but it is a great base colour being dusky pink. The Bare Minerals Ready Foundation in R130 is a powder I actually picked up simply to use as a top up when out and about, but I find that it can be a bit heavy sometimes so I use it very sparingly only when I really think I might need some extra coverage. My sole lip product here is a balm because I tend to have a couple of lipsticks in my handbag for if I want to look a bit smarter. I have written about the Korres lip butters before, and although I love their formula until last month I have never managed to find the Jasmine version in shops. I had heard about its sweet scent and I have to agree, it definitely is much more like cookies than flowers. It is soft and nourishing and perfect for priming the lips. I have a few eye products but I generally only use one or two at a time as I am pretty simple with my eye makeup on a day to day basis. Stila Kitten is my perfect highlight eyeshadow, if I need to brighten up my whole eye area I pop some of this on the lid, and if it is a special occasion I pop some of the MAC paint pot in Bare Study underneath. Sometimes for an uncomplicated look I slick a bit of this No7 Eye Shadow Mousse in Fudge over my lids with my finger to give a smokey uncomplicated look with a bit of depth. If I want to get fancy I also carry the same product in Plum, and also brush some of the No7 Stay Perfect shadow in Truffle into the crease too, but I most often use the powder to line the lashes and add definition. If I think there is more of a chance of a special social occasion I will grab my Naked Palette, but it doesn't get a huge amount of use day to day. It is far too complicated picking which colour to go with! Finally my trusty Shu Uemura eyelash curlers have had quite a battering and could do with replacing, I never ever go without curling my lashes, as a glasses wearer I find it makes a huge difference to how your eyes appear behind your frames. At the moment I am using Lancome's Hypnose Doll Eyes mascara which is lovely and natural, but I am not a loyal mascara wearer so this changes all the time. Also in my bag at the moment is the Origins GinZing mascara which is on its last legs but which offers a lot more oomph for big lash days. I carry eye liners but I have to admit I rarely use them. I have quite sensitive eyes that are easily irritated, but if I am wearing contact lenses I find my eyes disappear into my face if I don't line them in some way so I carry the L'Oreal Carbon Gloss Liquid Liner and the Gosh Velvet Touch Kohl in Brown just in case I need them. So there you have it, along with a few brushes and my Les Tai Tai mirror, the current contents of my makeup bag. I am hoping that a few of these almost finished products will get used up soon so that I can move on to some of the other things in my makeup drawer (which has been relegated out of my desk into my storage chest). Do you use a bag or has your collection grown beyond its usability too?